I am very happy to be a part of foodbuzz which is an exlusive online community of foodies around the world. Tons of recipes from different cuisines and restaurant reviews are the key features in the foodbuzz foodie community. I get to meet a lot of people around the world who share the same interest - FOOD. Time flies whenever I am logged into foodbuzz, grazing on different recipes submitted by the Foodbuzz featured publishers. For summer, Foodbuzz sent me a surprise gift. I received a cool summer tote with badges printed 'Paajaka', a variety of seeds etc. 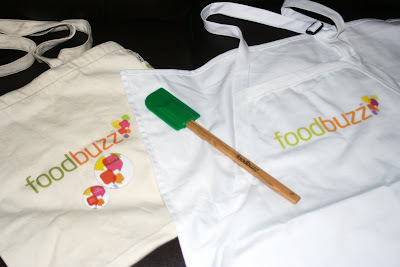 Thank you foodbuzz, I love the bag and I have been using it almost everyday. A couple of days ago, I received a suprise gift from foodbuzz again. It was a beautiful apron and a spatula. Thank you once again for sending those gifts. That is so cool, you are getting gifts from them. How lovely! I'd seen the Food Buzz ads in many blogs but never ventured to check it out. Seems really cool!